Some people grown when they hear that a CD is a re-release, they see it as a money-grabbing affair for both the artist at hand and of course their record label. I’m probably naive but I don’t see it that way at all, I see it as a chance for those who missed out the first time around to snap up an album and have a listen to see what they missed out on. That is certainly the case as Season Of Mist re-releases ‘Desert Northern Hell’ an absolute classic black metal album that clearly shows why the Norwegian Gods known as Tsjuder were (or should that be are seeing that technically reformed in 2010) trend setters in their chosen genre. ‘Desert Northern Hell’ takes you back to 2004, a time when black metal was still in its pure unadulterated fashion… yes that’s right there was a time when it hadn’t been tainted by the other genres surrounding it. 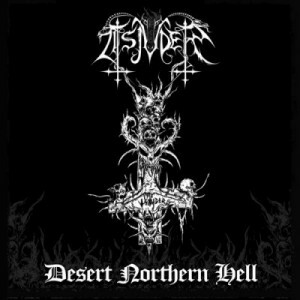 Actually ‘Desert Northern Hell’ sees Tsjuder playing the sound that made 1990s black metal fresh and even now some eight years later this is still one hell of an album to listen to. Tracks like ‘Malignant Coronation’, ‘Helvete’ and ‘Unholy Paragon’ are absolutely brilliant and thanks to the maturity and skills of Tsjuder the album never once gets repetitive. Lead singer, Nag growls up a storm and on tracks like ‘Sacrifice’ you can really hear the emotion in his voice. If you’ve never given ‘Desert Northern Hell’ a chance then this is the time to because this is a death metal masterpiece.